This book opens by approaching current trends in preparation and chemical modification of flocculant polysaccharides derived from plants and their flocculation performance. In addition, aspects including mechanisms of flocculation, chemical modification, the effect of physicochemical factors on flocculating activity, and recent applications of flocculant polysaccharides are reviewed. The authors go on to propose plant extracts which can efficiently perform coagulation and flocculation operations without the environmental risk of residual sludge with high concentrations of aluminum or iron. A separate study aimed to use the organic polymer from Opuntia cochenillifera cactus associated with the addition of aluminum sulfate to treat the water of a lentic body applying coagulation, flocculation, sedimentation and filtration processes. 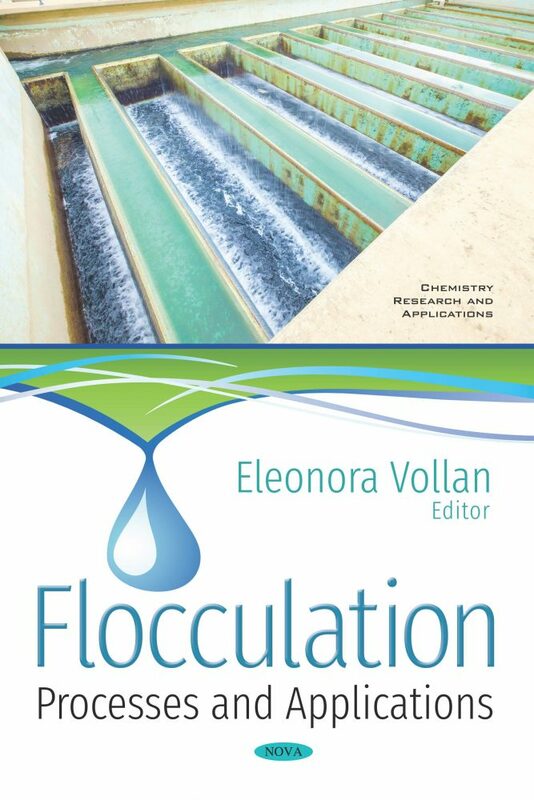 The authors propose that the design and operation of flocculators is crucial for the process efficiency andlargely dependent on the following features: floc characteristics, flocculation kinetics, and engineering aspects of flocculation. This compilation also discusses current knowledge on algal organic matter (AOM) flocculation, the impact of AOM on the removal of other compounds and links AOM composition and character to the efficiency of flocculation, the reaction conditions and mechanisms and finally, to the properties of flocs. Additionally, the performance of natural coagulant tanin compared to chemical coagulants aluminium sulphate and ferric chloride commonly used in the treatment of raw wastewater from tannery, by means of the physicochemical processes of coagulation, flocculation and sedimentation are examined. Through physical and chemical parameters, the efficiency of the coagulation/flocculation/sedimentation/filtration processes using organic coagulants in the treatment of water from a lentic system in Brazil are examined as well. Later, the physicochemical performance of chitosan and mesquite gum as coagulant flocculent agent for the treatment of residual water of the cutting and packing of meat products factory is presented. The brewing industry generates effluent that can cause serious environmental impacts when not treated properly due to high loads of organic matter in its composition. Thus, in view of the growing emergence of breweries in Brazil and consequent increase in effluent production, alternatives are sought for the auxiliary treatment using coagulants and their efficiency is analyzed. Urban development also contributes to increasing water pollution, therefore the authors perform water treatment (through the electrocoagulation process) to calculate the cost of the operation. Eutrophication is one of the most prevalent water quality problems in the United States as well as other parts of the world. It has led to excessive growth of algal blooms, which not only cause the death of aquatic plants and animals, but also produce high levels of toxins and odorous compounds. The authors examine the performance of the coagulation/flocculation process using aluminum and ferric salt coagulants for the removal of microcystins. One study focuses on the coagulation flocculation of young leachate from the Kenitra city landfill. Tests were carried out by adding ferric chloride mixed with three flocculants, namely: the chitosan, the Superfloc SD2065 and the Himoloc. The authors outline research about combining assisted sedimentation with other operations such as oxidation processes in order to evaluate the solids removal of the complete designed wastewater treatment focusing on OMW treatment. The penultimate chapter focuses on the preparation and characterization of the chitosan based flocculant for removal of heavy metal ion prepared from chitosan by N-acylation with ethylenediaminetetraacetic acid monoanhydride. The concluding study aims to apply the Bratby method in the characterization of the turbidity removal process, through the determination of the kinetic aggregation coefficient (KA) of the flocs and the kinetic coefficient of rupture (KB) of the flocs.